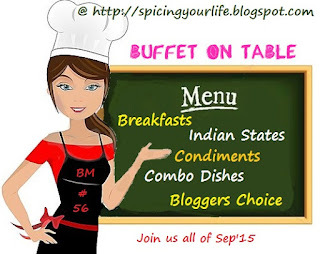 Today we are travelling to Odisha /Orissa for breakfast. We are already a big fan of tomato chuda and nadiya pachadi from this state. So, while looking for breakfast I came across this pitha made using coconut and rice @ +Srivalli Jetti space. I was worried about how it will taste, since i contains nothing other than rice and coconut, I was wrong, it tasted good when served hot and paired with proper side. You can either make dalma or any spicy vegetable curry. I paired it with tangy and sweet tomato khatta/Chutney. Soak rice for 2-3 hours. Drain the excess water, add the grated coconut and grind it to a fine batter. The Batter should be thin. Let the batter sit for 30 minutes. Heat a pan/tava , pour a laddle of batter on the hot tava in circular motion. do not make like regular dosa, it has to be done like rava dosa. Cover and cook in a slow flame. Do not flip the pitha. When the top portion of the pitha is cooked, take the cover off, and serve it hot along with a spicy curry. I served it with spicy, tangy and sweet tomato khatta/Tomato Chutney. That's an interesting version ! Tomato khatta is delicious to the Core and is a super accompaniment ! Very delicious looking pithas.Lovely combo. Pitha looks like rice flour dosa & must have tasted nice. I would prefer with a nice spicy curry or a chutney. almost like the neer dosa which has the same combo - rice and coconut.. this looks delish ! Again an interesting choice Priya, pitha with that chutney looks prefect pair. Looks like neer dosa..Learned lot of dosos from this Mega BM..Looks delicious & mouth watering. Wow learning a lot of new recipes. Good one. I have to try and make these easy to make dosas with rice and coconut some time. Looks so yum. Will love to make these. It sounds like neer dosa. I am not worried Priya as I know this tastes great. Add some palm Jaggery n you have the Goan equivalent.